This week’s topic is one that I share with each and every client that comes in for their first appointment with me. I think it’s also one of the most important things when looking for support in Holistic Nutrition: HOW + WHERE TO SOURCE YOUR ANIMAL PRODUCTS. If this is the only blog post you read from me this year, you done good. My work is always about reducing low grade chronic inflammation. When you do this work, you actively work at keeping chronic diseases at bay. Reaching for pastured or grass-fed sources when including animal products (meats + fats!)? This is something to prioritize if you wish to stay well. This blog post is not a debate on whether or not to eat meat. This is about The Minding and Keeping Of You. So what does it mean to purchase meat that is grass-fed, or pastured, or grass-fed/grain-finished and how does it differ from conventionally raised meat? It turns out that what the animal eats during its life can have a pretty big impact on the quality of the food. For the animal allowed to live on pasture when possible, their diet closely resembles what has been a traditional diet for that animal for the last few hundred years. It is a low-stress way of living for the most part, and allows for the animal to munch on the foods they have been designed to consume. These foods are incredibly nourishing to the animal, providing key nutrients and easy-to-digest foods so that they can develop and grow at a natural and normal rate. The meat from these animals then is low in inflammatory compounds, seeing that the animal was able to consume foods as it was meant to consume. This means your pastured beef and bison will provide you with a good source of the anti-inflammatory powerhouse Omega 3 Fatty Acid, along with other fat-soluble vitamins and their precursors A and E, essential vitamins to retain the integrity of our intestinal lining, our skin and keeping free radical damage at bay. Throw in D3 and K2 in the mix, higher in some animals’ fats than others, but good sources all-round. We need these for most systems in the body, including depositing minerals where we want them (bones! teeth!) and not where they aren’t wanted (arteries! gallbladder! kidneys!). As if these antioxidants weren't enough, important compounds glutathione and super-oxide dismutase, also antioxidant powerhouses are in good numbers in grass-fed products. These nutrients are necessary for keeping our engines and liver running clean. Oh yes, let me be clear: this is not just about the meat we are consuming. This is also about the other products we consume from animals, specifically the dairy. When milk comes from a pastured animal, the vitamin content will be higher in those all-important fat soluble vitamins A (retinol) and K2, necessary for skin health, intestinal lining integrity, brain health and bone health too. For the animals that are to live their lives out in a conventional way (aka CAFOs, or confined animal feeding operations), their diet is drastically different than what their systems were meant to handle; they are also supplemented with extras like antibiotics to help support their health, as a health management tool if you will in order to ensure good profits for the farmers. Surprise though, those antibiotics end up actually fattening the animals up faster, in order to get them sooner to slaughter. The problem is, an estimated 80% of the world's antibiotics are being used in agriculture. Such a huge amount of antibiotic use is now contributing to creating superbug infections in humans, due to antibiotic resistance as outlined by the World Health Organization. What does this mean? The frequent use of those antibiotics will harbour a space where bugs can build resistance, and no longer respond to our number one weapon, our antibiotics. That is NOT the situation we want to be in. Furthermore, the antibiotics in the animals remain in the meat we consume, and these contribute to wiping out our own gut flora. This means consuming meat that has been raised conventionally will have a negative impact in throwing our microbiome/gut bugs/flora/probiotics out of balance, which will contribute to further inflammation in our bodies and toxin load on our livers. Antibiotics are not the only supplement these feedlot animals are fed. Some get hormones and steroids supplemented, and their feed is not the kind of food the animal was meant to consume, nor made to digest. Imagine when you have a serving of a food you have trouble digesting. Know how you feel? Imagine having that meal every day. While being crammed in a small space. With a lot of other animals that feel like you do. Those are not conditions that are supportive to the animal; they contribute to higher stress levels too. And where do these toxins get stored? Always in the fat. So consuming fats from pastured animals will better serve you, my friend than reaching for the sources from conventional animals. By choosing butter or milk from a pastured cow, you will be reducing the toxin load your body has to deal with. And will get better nourishment from those food sources, as they will be higher in the fat-soluble nutrients. But dairy is not the only fat source from an animal; if you are consuming cuts of meat from a pastured animal, go ahead and eat the fat! Rendered fat from a pig is called lard and fat from a cow is called tallow. When the lard or tallow comes from a pig or cow that was fed on pasture, the nutritional profile reads such great amounts of Vitamin A in retinol form, the animal version we need for the health of our intestinal lining. It is also a fabulous source of Vitamin D3, a key player in thyroid function, essential to our immune health and bone building and maintenance to mention a few. Consume meat from an animal that has been raised on pasture and you will be making a choice that will support your gut flora, not to mention up the nutritional ante of your meals. Those fat-soluble vitamins are critical for our optimal health! For the love of your skin, your intestines, your brain, your bones, your glandular system, your reproductive system, heck for your lovely body from head to toe, aim to reach for animal products from animals that were fed on grass more often than conventional sources and your body will thank you. If you're new to pastured meats or grass-fed products, may I suggest contacting Alberta Farm Fresh Producers Association, an organization working to connect local farms and local people. Come August this year, Alberta Open Farm Days will be on again; follow their missives on how they work to connect local farms with people in the province at their website. I also have connected with a few local small farms that specialize in pastured animals; look for them via my facebook page (Scroll down to 'Liked by This Page'). If you're a local producer, I would love to connect! And it's a good-better-best kind of scenario, friends. If you're new to consuming pastured products and are put off by the higher cost, start by going 40/60, and adding a few good things at a time. Or purchase cheaper cuts of meat to get started; you can also eat smaller amounts of meat, knowing it is more nutrient-dense you don't have to consume big cuts. 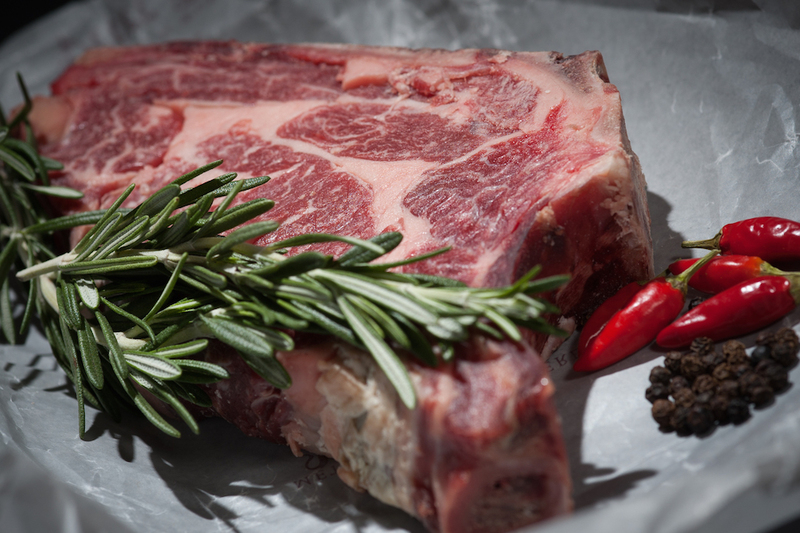 You will find an interesting series exploring Red Meat online here. Chris Kresser explores the health benefits of nutrient-dense red meat in a series of articles, and includes some yummy recipes too. Looking to explore the environmental impact a bit more? This series may be for you. And if you're really curious to understand a bit more about the health and environmental benefits of consuming products from animals raised on pasture, might I point you to this comprehensive article from the Weston A. Price Foundation called Splendor From the Grass.